Welcome to the Mulch Delivered Material Calculator. Here you can estimate your material needs. First, decide the materials and the shape of the area. Second, measure the area. Third, choose the material depth. Fourth, enter the information into the fields below. Be sure to enter your data for the correct shape (square into the square calculator option, round into the round option, etc.). *After you enter the above information, hit next. Please supply your name, email address, and phone number. Delivery customers – Please check the Delivery Box and supply your address. One of our Materials Specialists will call you to set up a date and time. *We will not sell your information. 1″ deep would cover 190 Sq. Ft.
3″ deep would cover 45 Sq. Ft.
1 1/2″ deep would cover 120 Sq. Ft.
3″ deep would cover 50 Sq. Ft.
2″ deep would cover 70 Sq. Ft.
3″ deep would cover 35 Sq. Ft. 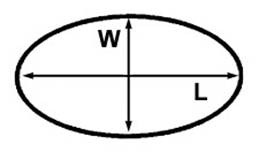 Note: liner comes in 10′, 15′, 20′, 25′, ect. Note: Tonnage on rock can be set to the look you are want in your pond or stream. 10 X 10 = 100 X 3.14 = 314 Square Ft. Consider the longest side of the triangle the base. Measure a perpendicular line from the opposite angle to the base to determine the triangle's height. Multiply the base by the height, and divide that number in half to determine the area. 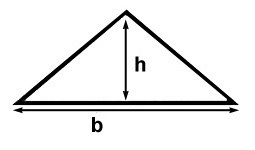 The area of a trapezoid is found by first finding the average length of the parallel sides (A + B) / 2, then multiplying the result times the height (h). The method used for irregular shaped areas is called the "offset method". First measure the length of the longest axis of the area (line AB). This is called the length line. Next, divide the length line into equal sections, for example 10 ft. At each of these points, measure the distance across the area in a line perpendicular to the length line at each point (lines C through G). These lines are called offset lines. Finally, add the lengths of all offset lines and multiply the result times the distance that separates these lines (10 ft. in this example).